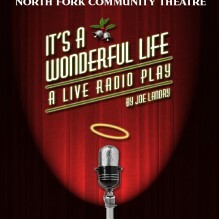 Saturday, December 5, at 8 p.m. and Sunday, December 6, at 2:30 p.m.
Visit George Bailey and Bedford Falls in a 1940s-style radio play based on the classic holiday movie. Five actors — Peggy Ashton Straub, Mike Hipp, Rusty Kransky, Kimet Speed and Phil Wilcox — portray more than 30 characters. Directed by David Scheer.